Mountain Biking Trails | Business & Tourism Creswick Inc. The Creswick Trails Project is set to make Creswick Victoria's most visited mountain bike park. The Creswick Pump Track is open daylight hours and is conveniently located within walking distance of the town centre and is accessible by train or bus. For more information and updates visit the Creswick Trails website. Other mountain biking trails around Creswick include the Creswick Township Loop, the Jackass Loop and the Slaty Creek Lasso Loops. Details of these trails are in the Creswick Walking and Cycling Map available from the Visitor Information Centre at 41-43 Albert Street (Midland Highway). The Ballarat-Maryborough Heritage Trail is a cycle touring route connecting the major townships of Maryborough and Ballarat via smaller settlements and other points of interest along the route. 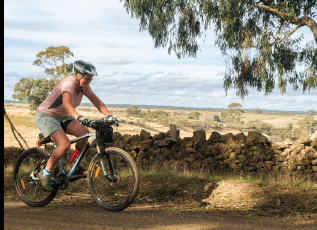 The route is designed for a country cycle on quiet, sealed and unsealed roads that take in some of the most attractive towns in the Goldfields region: Talbot, Clunes and Creswick. To download a PDF of the full trail click here; for the Creswick section, click here.